GBTimelapse is a Windows application for the capture of time-lapse sequences. It controls a Canon PowerShot Camera connected to your computer by a USB cable. 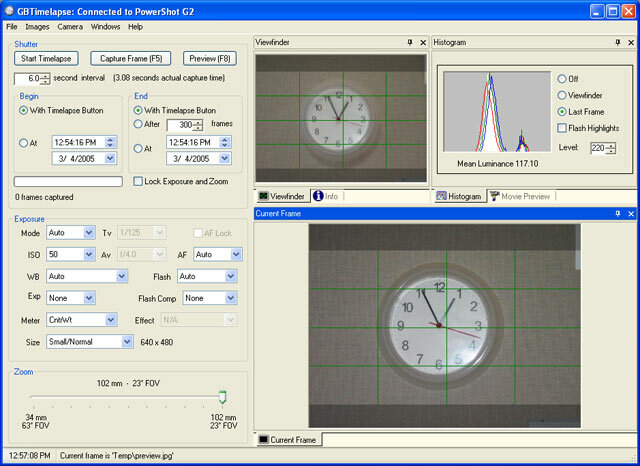 The camera's settings are changed and images are captured using the computer rather than the camera controls. A series of time-lapse images can be gathered automatically while the camera and computer are left unattended. Add the clips to your productions to make them more interesting. ...... Add the clips to your productions to make them more interesting. Anything that moves slowly or changes gradually is a candidate for time-lapse. When sped up it can look much more interesting. By using a Digital Still camera you aren't limited to the low resolution of a standard-definition video camera or web camera. Instead of low resolution you can capture high resolution images and create high-definition video files. Time-lapse footage is becoming an increasingly popular part of many new television programs and commercials. You can make some extra money by creating some high quality clips and selling them through one of the many time-lapse stock footage web sites. * "I find your software to be excellent. Not only is it just what I was looking for, but it worked flawlessly right out of the gate and I think the interface is beautifully designed", J.N. Qweas is providing links to GBTimelapse 1.3.6 as a courtesy, and makes no representations regarding GBTimelapse or any other applications or any information related thereto. Any questions, complaints or claims regarding this application GBTimelapse 1.3.6 must be directed to the appropriate software vendor. You may click the publisher link of GBTimelapse on the top of this page to get more details about the vendor.